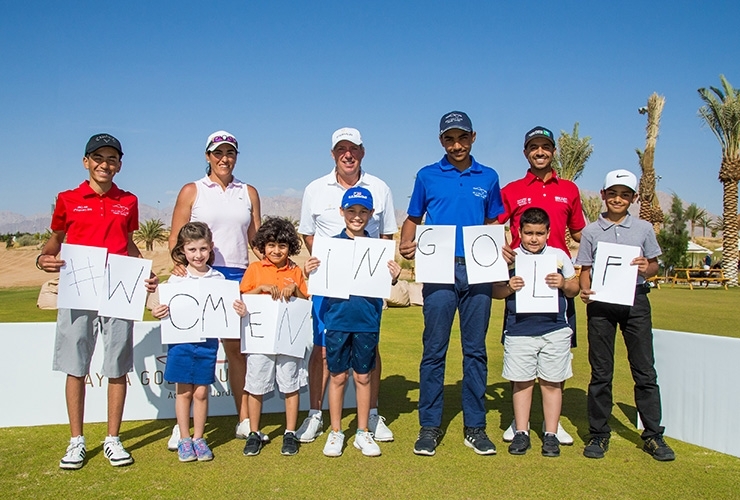 Carmen Alonso, Barry Lane and Othman Almulla hosted a clinic for local school children at Ayla Golf Club on the eve of the Jordan Mixed Open after the club officially signed the R&A’s Women in Golf Charter. Spanish Ladies European Tour player Carmen Alonso, Saudi’s first professional golfer Othman Almulla and former Ryder Cup player Barry Lane were all on hand in Aqaba as Ayla’s Director of Operations, Chris White, confirmed the club’s support for the principles of the Charter. It came on the eve of the inaugural Jordan Mixed Open Presented by Ayla which started Thursday. The event, the world’s first mixed open, a pioneering event that will see men and women go head-to-head over the same course, for a single prize purse and trophy, is a key part of the club’s gender equality drive. “As Jordan’s first championship course we believe that it is extremely important that we demonstrate that golf is a game that can be played by everyone, regardless of age or gender,” said White. Ladies European Tour player Carmen Alonso, aspiring young Ayla Golf Club-member Pera Demirsoy and Chris White, the Director of Operations at Ayla Oasis, at Wednesday’s official announcement. The ground-breaking Jordan Mixed Open will not only promote gender equality on a global stage but is also intended to empower local women and will encompass a series of talks from inspirational Jordanians who have overcome gender barriers to success in their respective fields. R&A Chief Executive Martin Slumbers hailed Ayla’s efforts to grow female participation. “It is important that we continue to highlight the progress being made to promote greater diversity, accessibility and inclusion within golf. Ayla Golf Club has demonstrated its commitment to supporting these aims by becoming the first venue in the Middle East region to sign up to the Women in Golf Charter as well as hosting the world’s first ever mixed professional event this week.